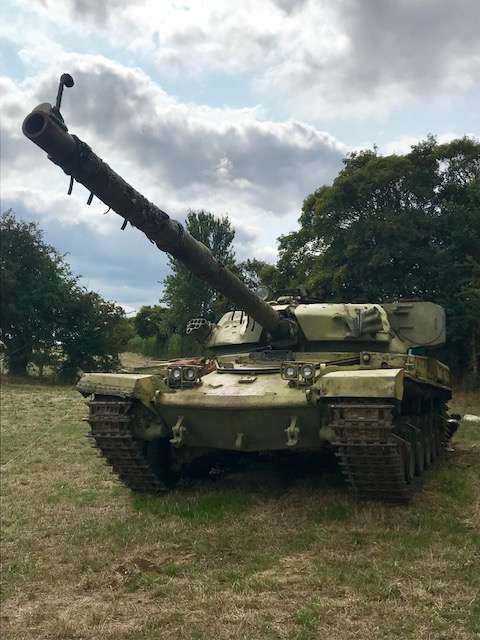 It seemed an odd line to recall, but it was a line that came to mind standing in a field at the edge of our village looking at a Chieftain tank. How likely is it that you would encounter such a vehicle at the edge of pasture land, electric-fenced to prevent the cattle from wandering? It seemed an extraordinary statement of liberty, to be able to buy a tank and park it behind a roadside hedge. For such idiosyncratic hobbies and pastimes pass to pass unremarked requires community where individuality is valued and cherished, it requires a place where you can be whatever you want to be. Living in Northern Ireland in the early-1980s, the society seemed the antithesis of the liberty that was assumed in England. The Free Presbyterians and the Baptists and the other assorted dour Protestant sects presumed to dictate how the entire community should behave. In his poem Tate’s Avenue, Seamus Heaney wrote of “locked-park Sunday Belfast.” In four words, Heaney captured a sense of the repression of a people by the life-denying religious zealots, people who presumed to tell everyone that they must live by the narrow Puritan rules by which they themselves lived. The owner of the tank, going to shows and fairs on Sundays would have not enjoyed the favour of the fundamentalist pastors and their flocks. Had Monica Ali been writing about Belfast in the 1980s rather than about Brixton twenty years later, “you can do whatever you like” would not have formed part of the dialogue. The freedom celebrated in Brick Lane, like the freedom acquired in Northern Ireland through years of struggle, is a freedom that is only possible by consent, people are free if other people allow them to be free. Freedom is about being allowed to form our own opinions and make our choices, without duress. Individual freedom, no matter how oddly that freedom may be expressed, has been assumed as an essential element of English culture. There has been an assumption that new arrivals to the country will become part of the liberal culture where tolerance and individual freedom are cherished. Tensions that have arisen have owed much to the perception that other cultures do not allow the freedom that is expected. The simplest way for such tensions to be defused is for communities to demonstrate that individual liberty is as much part of their lives as it is part of the life of someone who drives a tank for a hobby. I was in one of those things. A couple I knew up in Bray rented space for Ardmore to store big equipment. They are shockingly small inside.